This tutorial will show you how to use a few of the widgets that come with GrADS to create basic Graphical User Interfaces (GUIs). We will use these tools, to create a functional calculator. This exercise should familiarize you with how to make basic GUIs using the GrADS scripting language. I have been on the fence about writing a full tutorial about GrADS widgets, as there is already a lot of good material out there describing how to use them. Though ultimately I decided that it would be beneficial to have a more in depth tutorial that really details some of the logic involved. So, if you are just looking for fast reference, this tutorial may be a bit much. If you are looking for a quick reference, I encourage you to check out this site. Before you start the tutorial, you may be thinking to yourself; "Why go through all the effort to write GUIs?" GUIs are nice because they are what most people are familiar with, and often times I find it easier to use a GUI interface that has many preset options built in, rather than slightly editing code, or manually inputting different values into the console. So in that respect, it is worth the upfront time and effort to write the GUI, so you can accomplish a wide variety of operations with the click of a button. Lets get started, as always (and so you know what the end goal is), below is an image of the finished product. In writing this tutorial, I have wracked my brain a little trying to figure out a nice way to summarize GUI structure using the GrADS widgets. The best thing I could come up with is that when you write a GUI, you need to create the infrastructure first; the buttons, the drop menus, etc., then you need to write the functions of each individual component of that infrastructure. The first thing we need to do is set up the infrastructure of the GUI, this will serve as sort of the skeleton that the calculator functions will work with. To set up the GUI infrastructure, we are going to break the buttons into 4 groups. In addition to the GUI components, we need to include some dynamic updating of the "Display Screen." This will be straightforward though, as we will just use the 'draw recf' and 'draw rec' commands to update the display. Before we get to the display, we will start by going through writing each group of widgets separately. Since this is the first examination of the GrADS 'Button' widget, I will briefly explain the syntax used. So the two relevant commands for the Button widget are: 'set button', 'draw button' and 'redraw button.' The first two commands are followed by numerous arguments, the last one only requires one argument, and determines if the button is in the "on" or "off" position. The "set button" command sets up the style of your button, the color, the text color, and the borders. Where the first 4 arguments represent the OFF position; text color, face color, bright color for border shading, and the dark color for the border shading. The second 4 arguments represent the same thing, but for the ON position. The Final argument, sets the thickness of your shaded border, with large numbers creating a noticeable 3D bevel effect, and small values basically draw a line around your button. The above command is the style used for the calculator, and it sets the number key buttons to be gray colored with white text when off, and gray colored with red text when on. A few other examples are shown below. Now that we have covered the 'set button' command, we need to look at the 'draw button' command. The most important argument is the Identifying number. This number is how you tell this button apart from all the other buttons in the GUI. It is important that you ensure that your buttons number is unique so that you don't have weird things happen when you click on it. Beyond that, the remaining arguments are just for formatting purposes, setting the button boundaries as well as the string (what the user sees). This would draw a square button, labeled Button1 in roughly the center of the GrADS display. Now that we are familiar with the 'set button' and 'draw button' commands, we can see how to write out the number keys of our calculator. I like to do everything inside of a loop. Generally, if I need to execute a command more than once, I try to use a loop to reduce the amount of text I actually have to write, so that's what we are going to do here. We are going to loop through each number 1-9, draw each row of buttons, and then draw the remaining two buttons (0 and .) on the last row. Since this is an advanced tutorial, I will just copy down the code for the loop, and let you make sense of it. This code, will draw all 11 buttons (0-9, and the decimal point). The environmental variables are there so you can play with the size and shape. Just make sure you note that each button is given its own unique identifying number, that number will come in handy later when we set up the actual functions associated with each button. The fact that each identifying number is equal to the string also comes in handy later. This code is similar the code used to write the number keys, but with minor differences. Once again, we use a loop to write out the operators. In order to illustrate the use of the 'drop menu' I chose to include a few "special" math functions in the calculator that you would access using a nested drop menu. So the drop menu syntax in GrADS is a little different than the 'draw button' syntax. Similar to the button widget, the drop menu also has a formatting precursor 'set dropmenu' This command takes up to 15 arguments, corresponding to different formatting options like text color, borders, widget color.,etc. These 15 arguments are well described here and in the interest of time, will not be thoroughly discussed in this tutorial. Though similar to 'set button' these values correspond to the same attributes, but under different circumstances, e.g., whether or not a given option is selected. I'll be honest, I usually just ignore the 'set dropmenu' command and use the default options, but you could make a really slick interface with fully customized colors and borders using this command if you so chose. The 'draw dropmenu' command is fairly straightforward. Similar to 'draw button' it requires 6 arguments, and the first 5 are identical to the first 5 arguments for 'draw button'. Again, be sure that your drop menus identification number is unique. The last argument is your drop menu. It is a collection of strings that represent different options with each option separated by a "|"
The string before the first "|" is what the user sees on the display when the dropmenu is not selected. This now tells your widget that you want option3 to point to a cascading drop menu with the identification number 10. Now, we just need to set up that cascading menu. For this, we use the 'draw dropmenu' command again, except we replace all of the spatial variables with the word "cascade." This specifies that you want this menu to be attached to another menu. Then, the syntax is the same, you need the identification number (in our example 10) followed by your options. So that it is for the basics behind the drop menu and the cascading (nested) drop menus. Now that we know how to use the 'draw dropmenu' command, I will show you how it's used in our calculator! This is actually easy, since we only have one drop menu in the calculator. First we simply reset the location and size of the drop menu relative to the rest of the calculator, then we just draw the drop menu. Notice that the parent drop menu has a unique identifying number, but the nested menu does not. This is because the identification for the cascading menu is in a different spot than the identification for the parent, so this does not need to be unique (More on this soon). The last group, the other important buttons; Enter, Clear (CE) and Exit and the display. The exit button is important as it will break the loop within the GUI, more on this when we build in the GUI functionality. But since there is nothing particularly new here, I'll just give you the code, and you should be able to see what it is doing. The display just draws a couple of rectangles above the button interface. And that should draw out the full calculator! If you haven't done so already, now may be a good time to take a quick break. Below we move away from building the infrastructure and get into designing the functionality to our calculator. The entire functionality of the GUI interface is based on the 'q pos' command. This command prompts the user to click somewhere on the display screen and returns information including the page coordinates, mouse button, and widget properties. More details on the 'q pos' command can be found here. The basic design we will use is a loop that keeps prompting the user to click on the screen until the 'quit' button is pressed. Within the loop is where the magic happens. So we first set up the loop, with the condition for exiting. Before we start the loop, we need to set up a few initial conditions. Since the calculator performs math operations on two numbers, we will need two numbers for variables, and a variable for the returned number. Lastly, we need a variable that represents the operator. So we do that before the loop. This sets up the initial conditions and starts the loop, and gathers the information about which button you are pressing using the 'subwrd()' function. Remember, the 'Quit' button identifier is 101, so we set the condition that if the returned button is 101, we break the loop. Now, lets write down the code that sets up the numbers. I'm going to just show the code, and explain it after. We start first with the condition that num is equal to something, and something other than the dropmenu. This sets it so that you can click all over the screen as many times as you want and nothing will happen. We then reset all of our miscellaneous buttons to the off position (this is purely for formatting, the actual button status is not used in any of the functions). To get the functionality of the buttons, we start by checking the condition that the num<12. This checks whether or not you are adding a number, or doing something else. Within that condition, there is the check for whether or not there is an operator set. Since we want to make this like a real calculator, if an operator is set, we put our numbers into num2, and if it isn't we put it into num1. We set numbers by concatenating strings, so you just keep pressing numbers to build up your number. We also need to distinguish if we add a number, or a 0 or a decimal point. Once our number is changed, we wipe the display and redraw it with the chosen number. This happens so fast, that it appears as if you are just entering numbers into the calculator. Next, we need to set up the operators. To keep things simple, and since there is already a conditional statement isolating the drop menu, we'll first stick with the first basic operators. This code just uses a bank of conditional statements to set the operator up. Once the operator is set up, and as long as you have selected a basic math operator the program loops through and sets all numbered buttons to the off position. Next up, the special operators. Note: This code is a little out of position, since the code that makes the calculations is within the conditional that excludes num=16. But it seemed to make more sense in this order for the tutorial. Since the drop menu identifier is in a different location when 'q pos' is called, we need get the drop menu identifier first. We then need to check if the drop menu is equal to the cascade, in which case, we need to get the cascade option. I add 10 to easily differentiate from the other values. 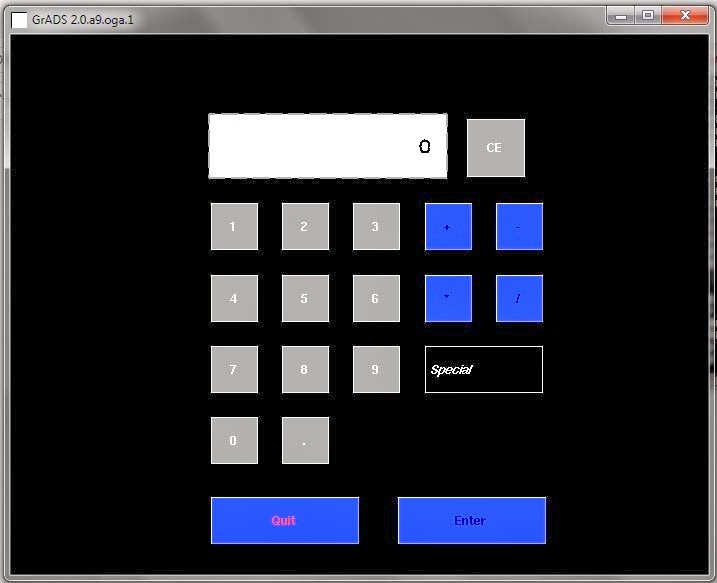 Then, we just set the op to the special values, and display the operator on the screen. Finally, we are almost done. Now we have all of our information, and we are ready to calculate our numbers! Going back into the conditional statement that excludes num=16. We start with the conditional value of 102 (the 'Enter') button. This code looks long, but it's more of the same. The only thing new is the block of conditional statements that performs the calculations based on what operation you have in place. Then you set num1 to the calculated value, so you can continue to make calculations using the newly calculated number. Now, we have one last loose end to tie up before we are finished with the calculator. The 'Ce' button. This button is designed to reset all the initial conditions, and redraw the display. That about does it! You now have a working calculator! More importantly, you should have a pretty good foundation in creating GUIs in GrADS using the 'button' and 'drop menu' widgets. If you followed the code segments throughout the script, it may be difficult to get a working script together due to some of it being out of order. It is therefore recommended that you download the script provided, and edit that as you please. I recommend that you play around with this script, change button styles, add or subtract special functions, etc. I hope you enjoyed this tutorial, and hopefully you learned something about using GrADS widgets. As always, feedback is much appreciated.